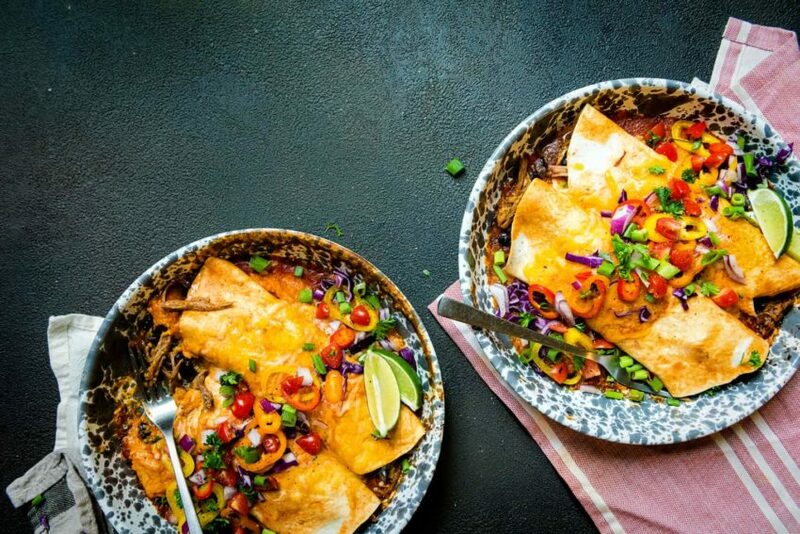 Smoked Pulled Pork Enchiladas are a fast and easy go to that are a great way to use up leftovers! Mix and match flavors and heat for your family’s tastes. 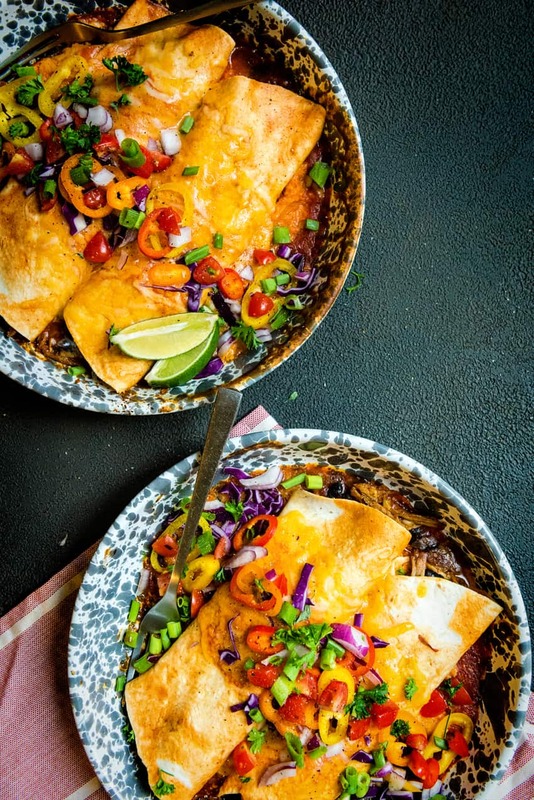 Enchiladas are one of my tried and true quick weeknight meals. They are crazy easy to make and can be loaded with anything you have on hand to change the flavor and fillings. Tacos will always be my secret love affair with food, but enchiladas are a close second. Much like stir-frys, I love using enchiladas to finish off veggies and meat cluttering up the fridge. And to make creative use of something that may otherwise be wasted. This is leftover magic. These enchiladas are stuffed with a smoked pulled pork I made on my Traeger Grill with a simple salt, cumin, brown sugar rub. After smoking to 195 I pulled and let the pork come to a temp that was easy to handle and shredded the meat. 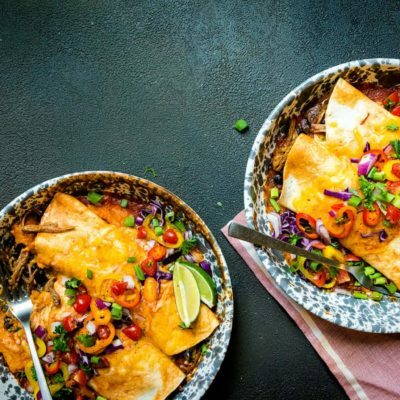 I batched it out and used it up making campfire tacos in my Lodge Dutch Oven, perfect slider, and a few breakfast egg quesadillas, and finally, these enchiladas. For one $12 pork shoulder, that’s a ton of bang for the buck. And the flavor didn’t disappoint. To batch out, portion out the shredded pork and allow for it to cool. In airtight bags, you can freeze for up to 3 months or store in the fridge for one week. 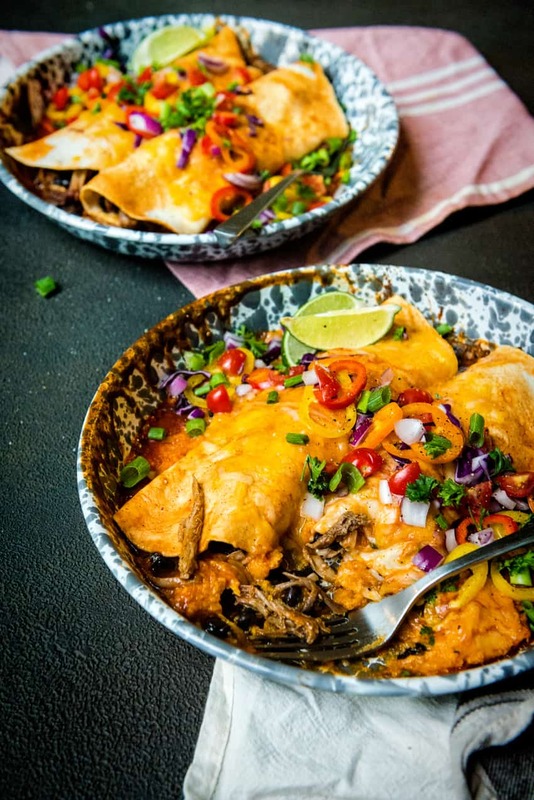 If you’ve tried my Smoked Pulled Pork Enchiladas recipe, or any other recipe on GirlCarnivore.com please don’t forget to rate the recipe and let me know where you found it in the comments below. I get inspired by your feedback and comments! You can also FOLLOW ME on Instagram @girlcarnivore as well as on Twitter and Facebook. Such a classic recipe with amazing flavor for any time of day. Smoke the sweet potatoes ahead of time in a smoker set to 350 for at least an hour, or until fork tender. Set aside until safe to handle and then remove from skins and mash, seasoning with a touch of salt and pepper as needed. The mashed sweet potatoes can be made ahead and stored in the fridge until ready to assemble the enchiladas. Preheat the smoker to 375 - 400 degrees. Combine the shredded pork, black beans, red onion, red and yellow pepper in a bowl with 1/2 cup warmed red Colorado sauce. Season with salt and pepper if desired. Place 1/2 cup of the warmed enchilada sauce in a shallow dish. Spoon another 1/4 cup of the enchilada saue into the bottom of a 9 x 13 baking dish. Arrange the mashed smoked sweet potatoes over the middle of the bottom, using the back of a spoon or spatula to create an even layer. Working one at a time, lay a tortilla in the shallow dish of sauce, coating one side. Flip and coat the other, allowing the excess sauce to drip off back into the dish. Lay the tortilla in the prepared dish and fill with the pork mix. Repeat until you have filled each tortilla. Top with the remaining Colorado Sauce and sprinkle the cheese over top. Place on the smoker and close the lid. Cook fr 25-30 minutes, until the cheese has fully melted and the edges of the tortillas are crisping. Remove from the smoker and garnish with the diced red onion, scallions, multi-color peppers, cherry tomatoes, and cilantro. I used oven safe dishes to create individual servings of this meal. If you have the option, divide the recipe to fill each plate.